From the moment we are old enough to be aware of advertisements, we’re bombarded with messages about how dairy is an essential part of a healthy diet. Want to grow up and have strong bones? Better drink your milk! Want to be like your favorite celebrities and athletes? Again, the answer is milk. More than any other food we consume, dairy is associated with calcium. As the be-all and end-all of calcium, cow’s milk has become a veritable superstar in the “healthful food” world. While it could be argued that the beginning of the marketing of dairy for its calcium content began after World War I, conveniently amidst a dairy surplus, the dairy industry has spawned into one of the most lobbied for industries in the U.S. In 2013, the dairy industry spent over $8 million on lobbying, and has already spent over $3.5 million on lobbying in 2014. Not to mention the fact that the U.S. federal government collects “industry fees” for dairy checkoff programs. Essentially, the government collects these fees from the producers of agricultural commodities to promote and “research” that particular commodity. As lobbying interests rally the government to put these dollars towards promoting dairy, the cycle perpetuates itself. Regardless of the questionable ethics of shamelessly marketing dairy to a population that is already in the midst of an obesity epidemic (cheese is the single largest source of saturated fat in the American diet), the promotion of milk has had other consequences. As corporations find more ways to slip more dairy into their products (Between 2009 and 2011, Dominos entered a $35 million partnership through a checkoff plan that led them to put MORE cheese on their pizzas – others in the industry followed suit) they are rewarded with financial gains and encouraged to drive up the market for dairy. At current rates, U.S. dairy farms produce 196 billion pounds of milk a year. In 2013, the U.S. dairy industry produced 11.1 billion pounds of cheese (excluding cottage cheese), 1.86 billion pounds of butter, and 1,052 million pounds of regular-fat ice cream. Where there’s an overabundant supply of dairy, there’s demand, right? … oh wait. While it is clear that the proliferation of the dairy is great for the U.S. economy, it turns out that it is not so great for the planet. The global water footprint of animal agriculture is 2,422 billion cubic meters of water (one-fourth of the total global water footprint), 19 percent of which is related to dairy cattle. This might seem like a huge amount of water, but considering that in the U.S. alone there are currently nine million dairy cows in the United States and that in a dairy operation, water is required to hydrate cows, clean parlor floors, walls, and milking equipment, water use adds up fast. A dairy facility that uses an automatic “flushing” system for manure can use up to 150 gallons of water per cow, per day. 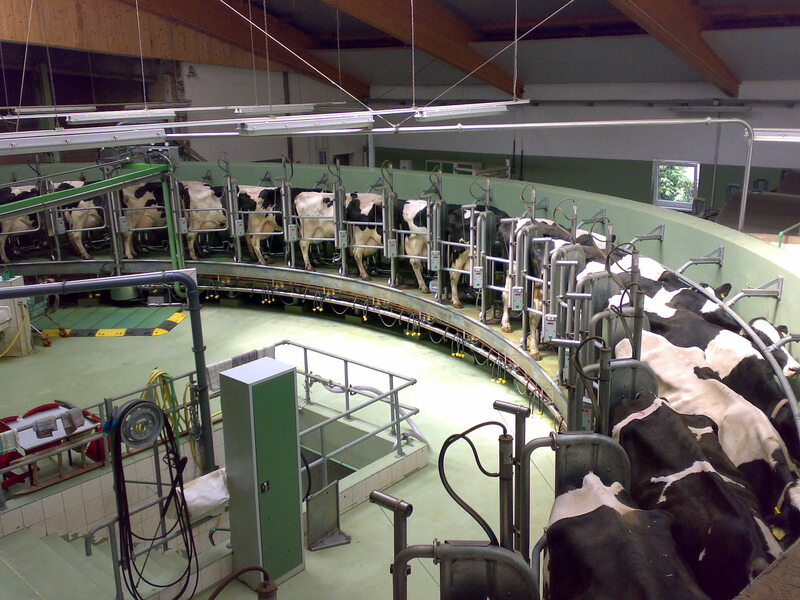 A medium size dairy factory farm facility houses between 200 and 700 cows (the EPA considers 700 dairy cattle the lower limit for a Concentrated Animal Feeding Operation). Using the maximum figure, this would mean that a medium-sized dairy factory farm would use 104,850 gallons of water every day – just for flushing purposes. Milk is about 87 percent water, so a cow that is constantly producing milk needs to sufficiently hydrated. A cow can drink 23 gallons of water a day, so given a facility with 700 cows, 16,100 gallons of water would be used every day for the cow’s drinking water. A study published by Mesfin Mekonnen and Arjen Hoekstra found that 98 percent of milk’s footprint can be traced back to a cows food. Dairy cows eat a LOT. Constantly producing milk is a huge drain on a dairy cows metabolism, and they need to replenish that energy through their food. According to the findings of Dan Putnam, a plant scientist at the University of California-Davis, it takes around six pounds of alfalfa to produce one gallon of milk. It takes 683 gallons of water to produce just six pounds of alfalfa. A dairy cow can produce up to seven gallons of milk a DAY, meaning that 4,781 gallons of water are used per cow every day for their food needs. When you add up the water used for food, water, and cleaning the facility the average dairy cow uses 4,954 gallons of water per day. When you multiply that to account for the 700 cows on a dairy factory farm that is 3.4 million gallons of water EVERY DAY. Accounting for the nine million dairy cows there are in the U.S. that number is astronomical. Around 21 percent of U.S. dairy comes from California. While this might not seem like a big deal, when you consider the extent of the current drought that is happening in California and how much water the dairy industry uses, that 21 percent is pretty significant. According to the FAO’s report, “Greenhouse Gas Emissions From the Dairy Sector: a Life Cycle Assessment,” estimates that the global dairy sector contributes four percent of total global anthropogenic GHG emissions. This figure includes emissions allotted to milk production, processing and transportation, and the emissions from fattening and slaughtering dairy cows. By and large, methane is the most troubling GHG produced by dairy cattle as it has the ability to trap up to 100 times more heat into the atmosphere than carbon dioxide. Around 52 percent of the GHGs produced by dairy is methane. It is estimated that cows produce between 250 and 500 liters of methane a day. Going back to our dairy factory farm with 700 cows, that is up to 350,000 liters or 325,500 pounds of methane pumped into the atmosphere every day. Gross. To put that into perspective, a single fracking well is responsible for the release of 30,684 pounds of methane a day. In developed countries, the FAO estimates that nitrous oxide makes up for another 27 percent of dairy cattle’s GHG emission. Where methane has a heat-trapping potential nearly 100 times larger than carbon dioxide, nitrous oxide has a global warming potential almost 300 times greater than carbon dioxide. So far, we’ve considered the water usage and GHG emissions involved in the production of milk. To create the many dairy products people enjoy requires even more water and yield higher GHG emissions. In comparison, it takes nine gallons of water to produce one glass of soy milk. For the greenhouse gas emissions associated with dairy products, the Environmental Working Group the production of four ounces of yogurt emits the same amount of GHGs as driving your car for over a mile. For four ounces of cheese, that number shoots up to the emissions equivalent to driving three and a half miles. Of all animal products, the Environmental Working group ranks cheese as having the third highest GHG emissions, coming in right after beef and lamb. For every one kilogram (about four, eight-ounce blocks) of cheese produced, 13.5 kilograms of carbon dioxide are released into the air. On average, an American consumes 31 pounds of cheese a year. So, an individual’s cheese habit alone could contribute 401 pounds of carbon dioxide into the atmosphere, annually. Considering the high cost that the dairy industry has on precious water resources and greenhouse gas emissions, suddenly that bowl of ice cream might not seem so cool. Some people might not be ready to dive into a dairy-free lifestyle head first, but there are many small steps you can take to lessen your impact on the planet. For example, if you chose to replace your two scoops of dairy ice cream for a dairy-free alternative, you could save 84 gallons of water from that single choice. Around 25 percent of the American population is lactose-intolerant, which means that dairy-free alternatives are readily available for anyone who is looking to avoid this particular food group. When you also take into account the fact that we don’t need milk to get nutrients like calcium, lessening your dairy consumption can seem much easier. To get you started, check out these non-dairy cheese recipes, these 5 Killer Vegan Mac and Cheese, and these out of this world dairy-free pizzas. You can even start by trying almond, soy, or coconut milk in your cereal instead of regular! By choosing dairy-free alternatives for milk, you can drastically cut your carbon footprint and save precious water supplies. With the wealth of available plant-based options available, it has never been easier to eat with the planet in mind. For more information on how you can help heal the planet with your food choices, check out the #EatForThePlanet book! Hi, do you have links to your sources? I also think a post about the environmental of plant-based "dairy" products vs dairy would be inteteresting. Great read! Great job with this article! Good details and excellent conclusion. You really know your stuff. I am well versed on the latest research in this area, and you are a head of the curve. Your are exactly right on the obvious outcome that we must all face: a plant based diet is the only way forward for individuals and the planet. I know you will be ridiculed by the those that think their small view of the world and their even smaller view of science some how entitles them to an opinion. Keep writing! I will look for your other articles.